little leftover nuclear waste. No problem. Smilin’ Joe Fission: I’ll just put it where nobody’ll find it for a million years. 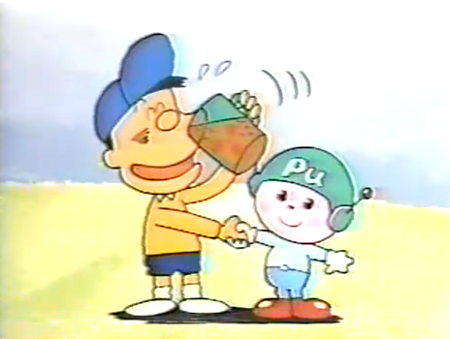 I have a confession to make: I’ve fallen head over isotopic heels in love with Plutonium kun, one of the image characters of Japan’s nuclear-industrial complex and star of my last post, pictured above giving his pal a refreshing glass of himself in a liquid state—hey, that’s what friends are for! (Don’t try this at home though kids, as plutonium only melts at around 640°c, and he may scald your tongue). It’s Plutonium kun’s chubby, ruddy cheeks, splendid posture, and shiny red booties that have stolen my heart away. I realize that might make me something of a cradle-snatcher, but having first been discovered in 1940, one could argue that he is already past pensionable age, which in Japanese gay parlance would make me a fukesen, or a chaser after old men. (What a fabulously concise language Japanese is, that such a delicate act can be boiled down to one word and three syllables—or four if you count them Japanese style). One thing is clear, though: with a half-life in his now most common isotope, Pu-239, of 24,100 years (how I love the precision of that tacked-on century), Plutonium kun has an awful lot of living—and quite possibly a fair bit of killing—left to do. Now Plutonium kun was a bad boy in his youth, a very, very naughty boy—think Fat Man and Nagasaki—but he was only five years old at the time, and we all know how unruly and destructive five year-olds can be, don’t we? Personally, I blame his deprived wartime upbringing and his worryingly non-nuclear family—imagine having four fathers (Glenn Seaborg, Edwin McMillan, Joseph Kennedy, and Arthur Wahl, since you ask) and not a single mother. But I’m convinced that with dollops of my TLC, I can help put Plutonium kun on the straight and narrow: after all, he’s hardly killed anyone since Nagasaki, signs no doubt of a growing maturity. 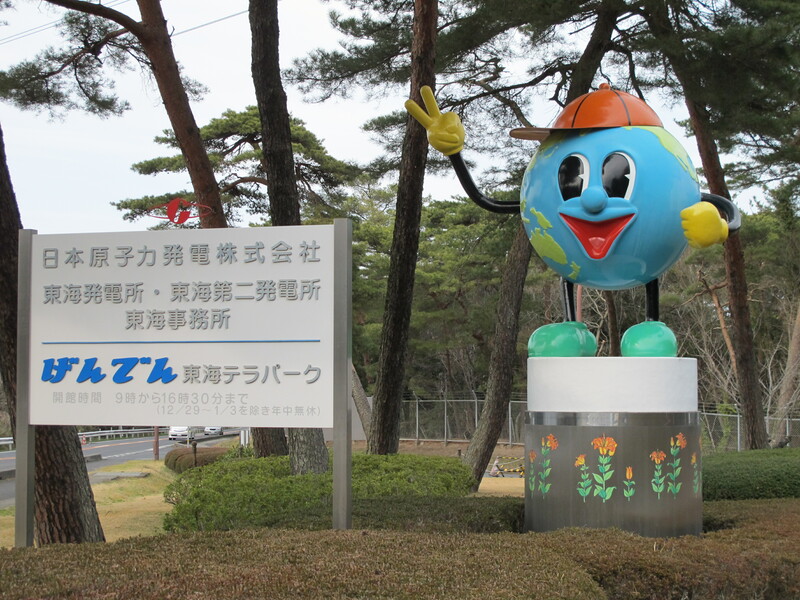 He’s a hard boy to track down around here these days, but on the grapevine I heard that he lives on at the Atom World exhibition of the Japan Atomic Energy Agency in the original nuclear village of Tokaimura, equidistant on the Pacific coast from Tokyo and from Fukushima Daiichi, at roughly 120km from both. Heading northeast out of Tokyo in the direction of Fukushima Daiichi on the Joban Expressway, it’s immediately apparent that something is awry: the electronic signs overhead scream out the earthquake-induced reduced speed limit and the disaster-driven closure of the expressway up ahead for a 30km stretch between Iwaki Yotsukura and Joban Tomioka—that’s because the top end of it peters out in the zone of exclusion. I turn off at the Naka exit: Naka’s current claim to fame is that it is home to an earthquake-devastated factory belonging to Renesas Electronics that alone manufactures perhaps a fifth of the microcontrollers—tiny chips used in auto engine control systems—that go into cars fashioned by Japanese automakers, and its absence may abet the coming plunge in auto output and associated recession. Earthquake damage here, some 300km south of the epicenter, is plain to see: sunken asphalt sidewalks, the result of liquefaction, their manholes elevated like so many champagne corks ready to pop, houses topped with blue tarpaulin hats, and concrete-block walls surrounding houses that have toppled onto side roads and into rivers. Here, the topography of a tennis court has been turned into that of a sandpit, there an old stone kura storehouse ripped apart as if hit by a grenade. The road from Naka leads toward the coast and into Tokaimura. 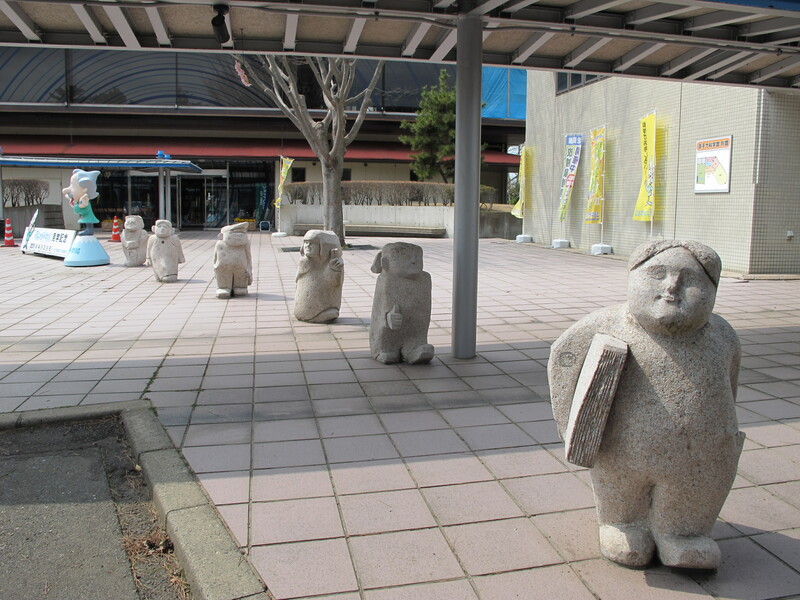 One of the oddest things about Tokaimura is its very name, which is worth a diversion. It’s the—perhaps ill-advised—product of a 1955 merger of two villages, Muramatsu and Ishigami, literally means “east sea village”, and looks like this: 東海村. But “Tokai”, written exactly the same way, is also the name of a distant region of central Japan centered on the auto manufacturing hub of Nagoya, and so both in Japanese and English the village is routinely referred to as Tokaimura, to distinguish it from the region, in a way that doesn’t happen, at least in English, with anywhere else in Japan—no one goes around referring to Tokyo as Tokyo-to or Osaka as Osaka-fu. Tokaimura’s administrative status as a village is thus underlined every time its name is uttered, and yet, with a (growing) population of around 37,500 and dense concentration of both nuclear and thermal power generation and research facilities, it’s hard to imagine anywhere less bucolically rural. It’s the third largest “village” in Japan and more populous than all but about 30 of the 750-odd towns found nationwide, more populous even than around 150 cities, yet it clings stubbornly to its village status. Why? 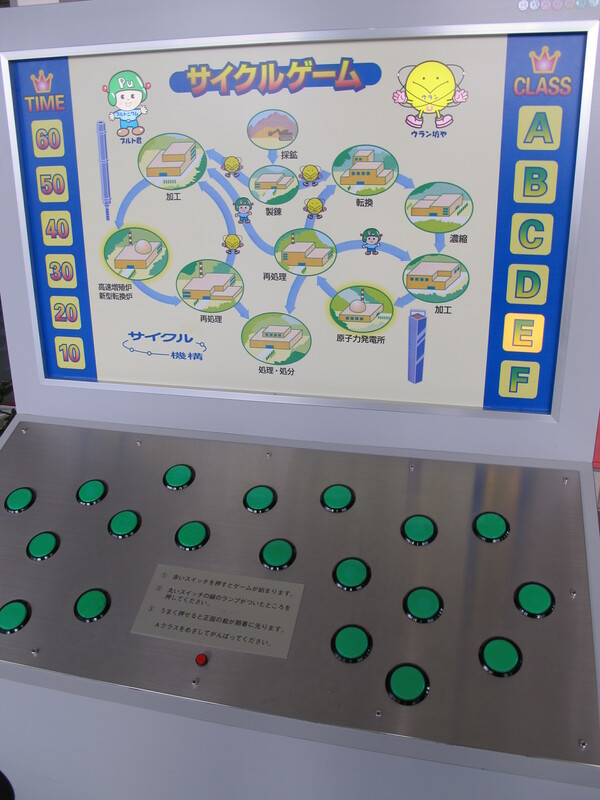 Not being privy to the workings of the village assembly, I can’t offer a definitive answer to that question, but a tantalizing clue comes in a still obscure Japanese expression across which I stumbled a few years ago: “the nuclear village” (genshiryoku mura, 原子力村). Initially baffled and obliged to translate it, I asked the author, an expert in the electric power industry, what it meant. It refers, he explained, to the insularity and secretiveness of the nuclear-industrial complex, the close-knit web of ties that bind the supervisory ministry, the Ministry of Economy, Trade, and Industry, the lapdog watchdog under the ministry, the Nuclear and Industrial Safety Agency, the power companies, and the suppliers of the nuclear kit, prominent among them Hitachi, Toshiba, and Mitsubishi Heavy Industries. This village mentality (mura ishiki, 村意識) is a microcosm of the national insularity encapsulated in a more familiar phrase, “island nation spirit” (shimaguni konjo, 島国根性), and it demands unwavering loyalty to the—in this case nuclear—cause, on pain of being subject to ostracism (mura hachibu, literally “village eight parts”, 村八分), in which in its original sense, those who infringed the codes and order of the village were excluded from eight of the ten social activities deemed essential to the life of the village, the only exceptions being firefighting—to prevent a fire spreading from the home of the ostracized—and funerals—those of the ostracized themselves. So it just might be that Tokaimura clings to its village status as a way of reminding its nuclear villagers of the need for obedience and the penalties for disobedience. There’s another interesting nuclear expression that applies to Tokaimura: nuclear Ginza (genpatsu Ginza, 原発銀座), a portmanteau that unites the colloquial for “nuclear power station” and The Ginza, Tokyo’s chic shopping district, and suggests a high concentration of nuclear activity, and the phrase, bizarrely, is one of the first I ever learned in Japanese. Tokaimura is the original and one of three nuclear Ginzas, the others being the most famous one on the Sea of Japan coast in Fukui and the other far to the north in Aomori. Tokaimura is home to the Tokai No. 1 nuclear plant, Japan’s first, which is being dismantled, Tokai No. 2, both of which are operated by the Japan Atomic Power Company, which in turn is owned by the electric utilities, the largest shareholder being TEPCO, two Tokai R&D centers and the headquarters of the quasi-governmental Japan Atomic Energy Agency, one specializing in nuclear science and the other in nuclear fuel cycle engineering, and the Japan Proton Accelerator Research Complex (J-PARC) a joint venture between the Japan Atomic Energy Agency and the High Energy Accelerator Research Organization, an inter-university research institute, to say nothing of smaller facilities such as the Ibaraki Quantum Beam Research Center and the Nuclear Material Management Center and leaving aside the massive Hitachinaka thermal power station. That’s a nuclear Ginza and no mistake. So dense is the concentration of the facilities on the coast that, as far as I could tell, it is at no place accessible to the public possible to see the Pacific from the village. “Nuclear Ginza”, incidentally, is the title of a 30-minute documentary—highly disturbing but frustratingly short of hard facts—made for Channel 4 in the UK about, among other things, how yakuza hoodlums hire day laborers and members of Japan’s underclass of burakumin (部落民, “village people”, that “village” word again) from the slums of Osaka to do the most deadly radioactive mopping up at nuclear plants on the Fukui coast, a documentary that could never be made by state broadcaster NHK, touching as it does on not one but a trio of huge taboos, and could never be made by Japan’s private-sector channels, as the electric utilities are too lucrative advertisers to lose. You can watch it here. Tokaimura—abetted by the British and the Americans—played midwife to the birth of Japan’s nuclear power industry when on August 27, 1957, at 05:23, just a dozen years after the end of the war and less than a year after the opening of Calder Hall, the world’s first commercial nuclear power plant, Japan Research Reactor 1 (JRR-1) reached criticality here, and superficially at least, the nuclear-industrial complex has in the many intervening years been good to the village. Its finances are in the rudest of health, with a 2009 fiscal strength index (zaiseiryoku shisu, 財政力指数) of 1.78—which essentially means that it generates a 78% local tax surplus and needs less than nothing from the central government—that ranks it fifth out of 1,750 or so municipalities nationwide in fiscal solidity. (Incidentally, this is exactly the case too for Okuma-machi, the town inside whose boundaries reactors No.1 to No. 4 of Fukushima Daiichi sit, which has a fiscal strength index of 1.50, ranking it 23rd in the nation and first in Fukushima Prefecture for fiscal solidity). Thanks to an abundance of supremely stable and relatively well paying jobs, Tokaimura’s birthrate is the highest in Ibaraki Prefecture and about a third above the national average. Nuclear-fuelled prosperity is readily apparent driving around the village: the houses are newer and larger than in surrounding municipalities and the village hall has the air of the campus of a handsomely endowed university. Nuclear ideology has seeped deep into Tokaimura’s pores. 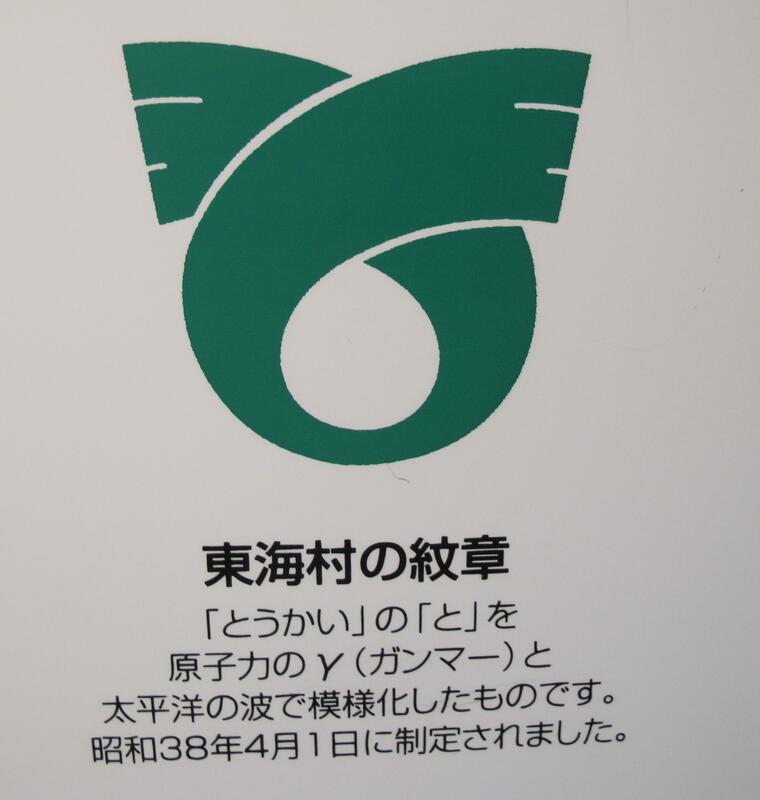 This is the village crest, which purports to combine the hiragana と　(“to”) of Tokaimura with the Greek γ symbol for gamma radiation in a Pacific Ocean wave motif. 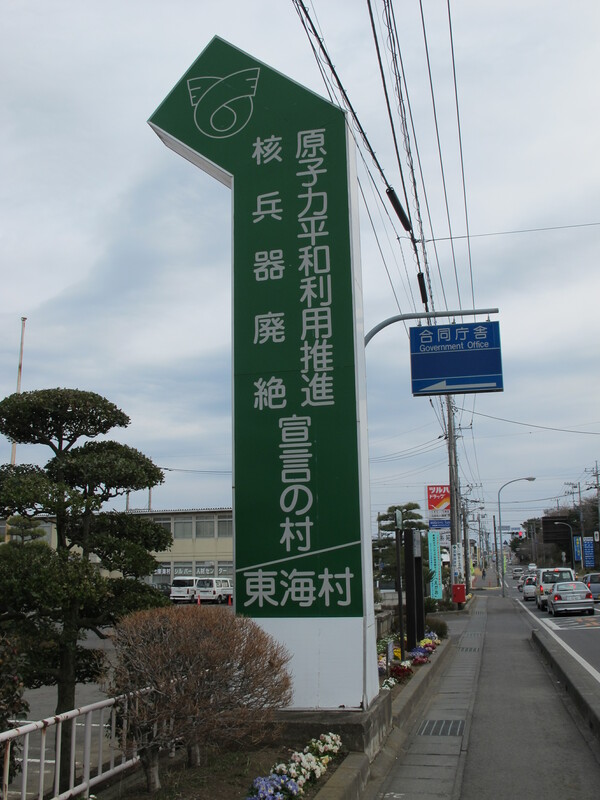 This roadside sign proclaims that Tokaimura is determined simultaneously to promote the peaceful use of nuclear power and to eradicate nuclear weapons, a tricky balancing act if ever there was one. On the way to Atom World, my attention was distracted by a giant rotating Einstein figurine. 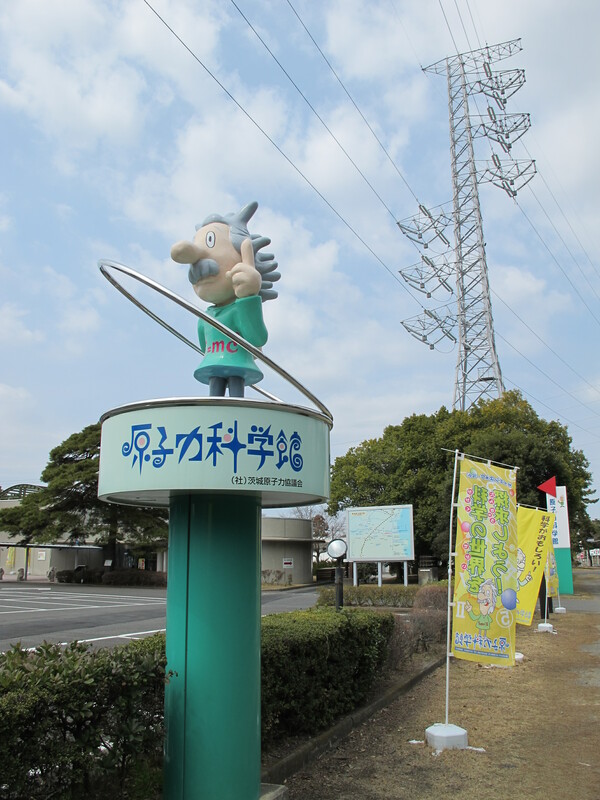 He turned out to be the image character of the prefecturally-run Ibaraki Science Museum of Atomic Energy. I wonder whether the museum pays royalties for the use of Einstein’s image to The Hebrew University of Jerusalem, as it should. 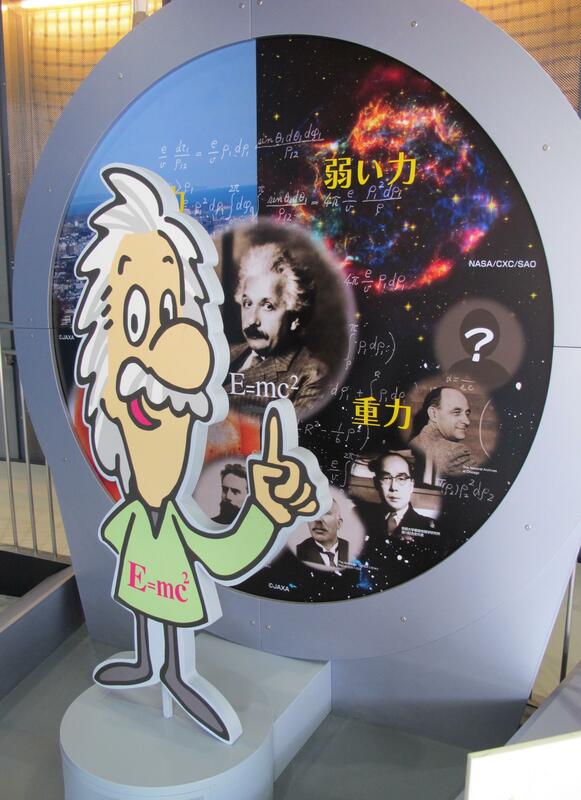 In the plaza outside the entrance there stands a parade of squat stone statues titled “The Walk toward Tomorrow” (旭への歩み), a spot for memorial photos with Einstein pointing this way and that, and an irresistible invitation to visit the JCO Criticality Accident Exhibition. Let’s go! Tokaimura is the sister village of Idaho Falls, Idaho, and that’s no coincidence, as it was at the National Reactor Testing Station west of Idaho Falls that on December 20, 1951, Experimental Breeder Reactor-1 (EBR-1) first produced electrical power from nuclear fission. There is a less auspicious parallel, too: the station was the site, on January 3, 1961, of the only fatal nuclear reactor incident in US atomic history, killing three, just as Tokaimura was the site, on 30 September, 1999, of—so far—the only fatal nuclear radiation incident in Japanese atomic history, killing two in gruesomely protracted (83 days and 211 days) multiple organ failure deaths, seriously injuring another, and exposing hundreds to unsafe levels of radiation in the world’s last—most recent—criticality accident. The accident occurred, as the exhibit is honest enough to explain, because untrained workers, in defiance of a rulebook of which they were ignorant, poured uranium solution manually using a beaker (some call it a bucket) and a funnel. 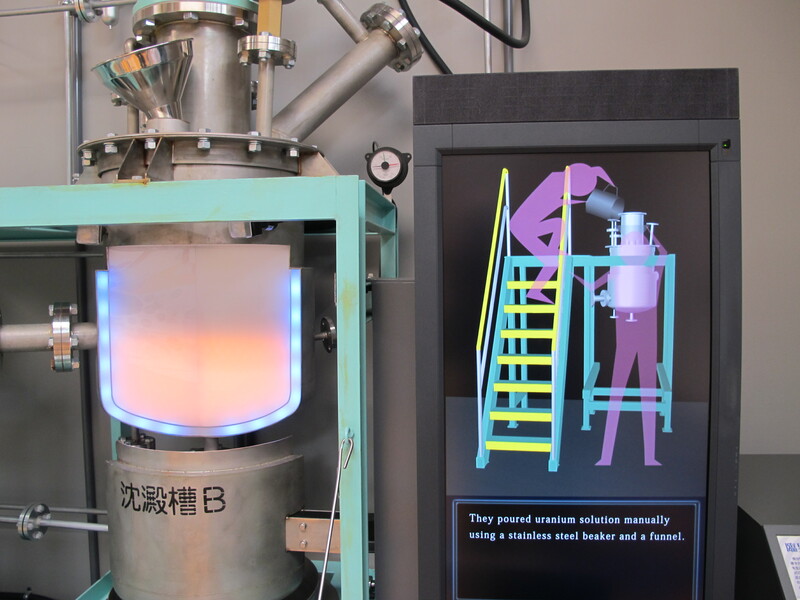 As the exhibit reaches mock-criticality, the precipitation tank on the left emits a blue flash in imitation of the ionized air glow characteristic of criticality witnessed by at least one of the workers and definitely not something you would want to witness at close hand in real life. The exhibit does not dwell on the wretched last days of the two dead, their chromosomes destroyed, nor on the subsequent prosecution of six JCO executives for professional negligence resulting in death or injury, which Tokyo Vice author Jake Adelstein suggests, correctly I think, might serve as a template for the prosecution, once the radioactive fallout clears, of TEPCO executives, in what promises to be the nuclear trial of the century. Of as great an interest as the criticality exhibit itself was a certain bureaucratic randomness to the hall in which it was housed. Why, for instance, did it stand next to a newish, made-in-Japan grandfather clock, of all things? Why was there a giant Tower of Hanoi puzzle in the entranceway? Who had decided that taxpayers’ yen was well spent there? The criticality exhibit occupied but one corner of the hall, the rest being given over to the wonderful, peaceful application of all things nuclear. 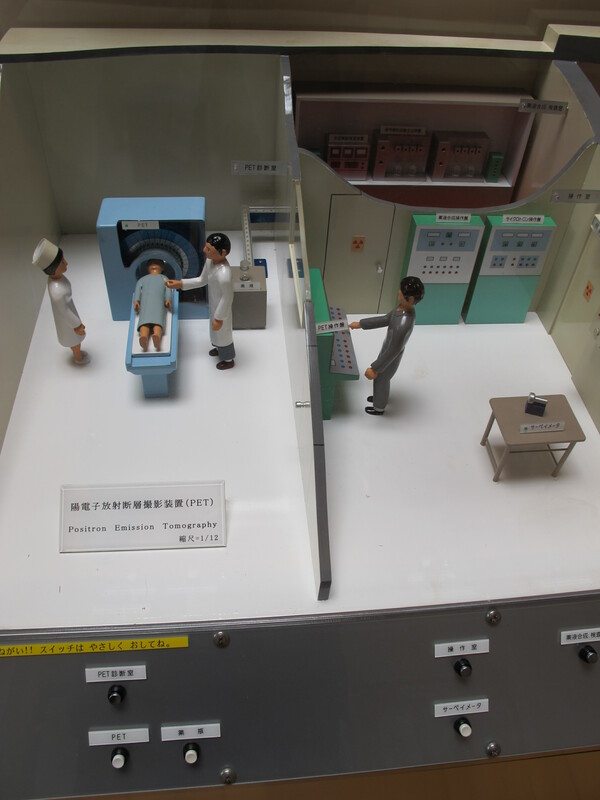 I was particularly taken with the one-twelfth scale mock-up of a positron emission tomography scanner. On my way out, I picked up a free copy of the latest available edition of Nuclear Industry News, dated March 17: Grave damage to Fukushima Daiichi No. 1 to No. 4 reactors, blared the front-page headline, though an article inside carried more uplifting news of efforts to sell the AP1000 pressurized-water reactor of Toshiba subsidiary Westinghouse via Spanish utility Endesa in Latin America. 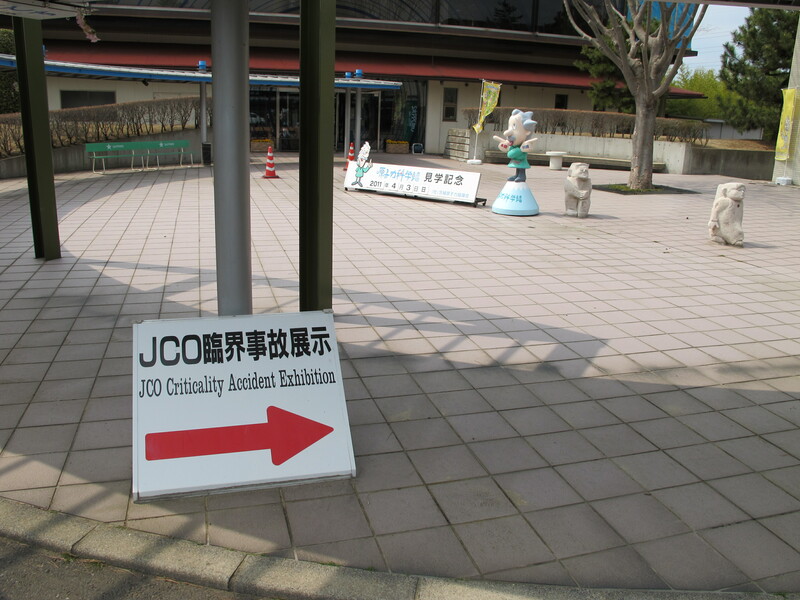 The JCO Criticality Accident Exhibition was just a sideshow; there was much more nuclear fun and games to be had in the main hall, dubbed The Dream Cylinder. There was Uncle Albert again, ushering me in. (shouldn’t that be “stimulated”, not “simulated”?) 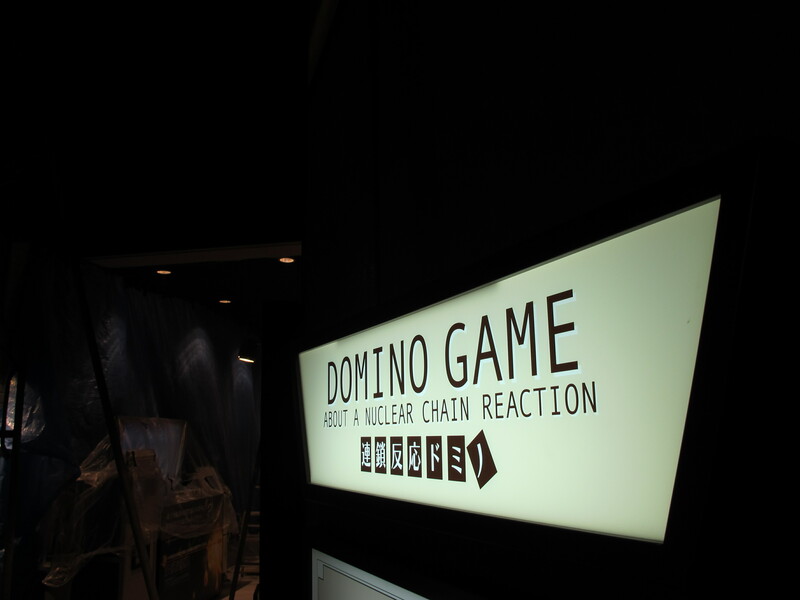 and the Domino Game—about a nuclear chain reaction. Worthily educational displays were topped by friezes with language that in the current context seemed unfortunate. Among a series of flip cards, one asked the question on the lips of the nation. Is nuclear power safe? Flip over and see! I had to steel every ounce of my being to stop myself from stealing a stuffed Einstein doll from a neat row of them in a deserted workroom on the way out. But where was the boy to whom I’d lost my heart? 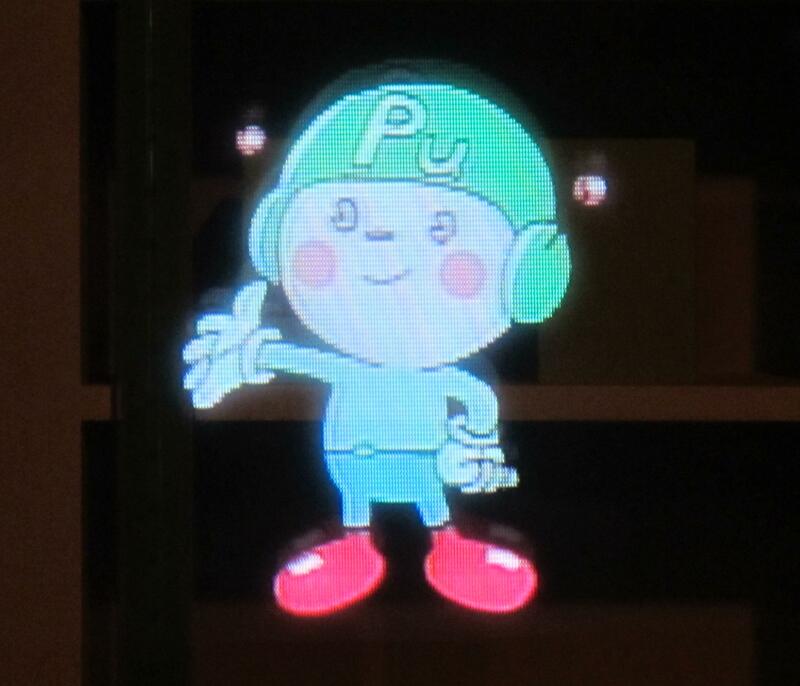 At long last here he was, with his disgruntled looking chum Uran boya (ウラン坊や, Kid Uranium), on the Atom World sign. Atom World as a building turned out to be a nondescript monstrosity of banality bearing a regrettable resemblance to a nuclear power plant. 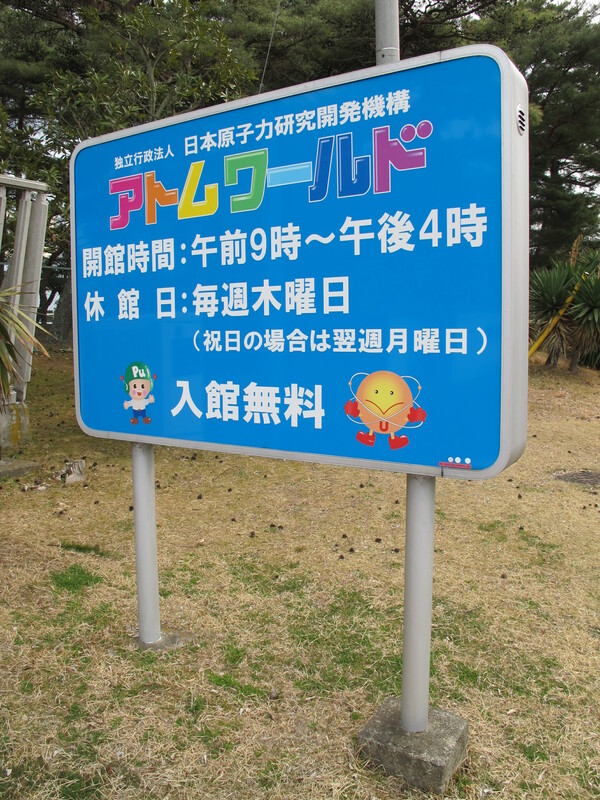 It too had been damaged by the earthquake, and had been forced to close for a fortnight, but how could anyone in their right mind deprive the world of Plutonium kun for any longer? 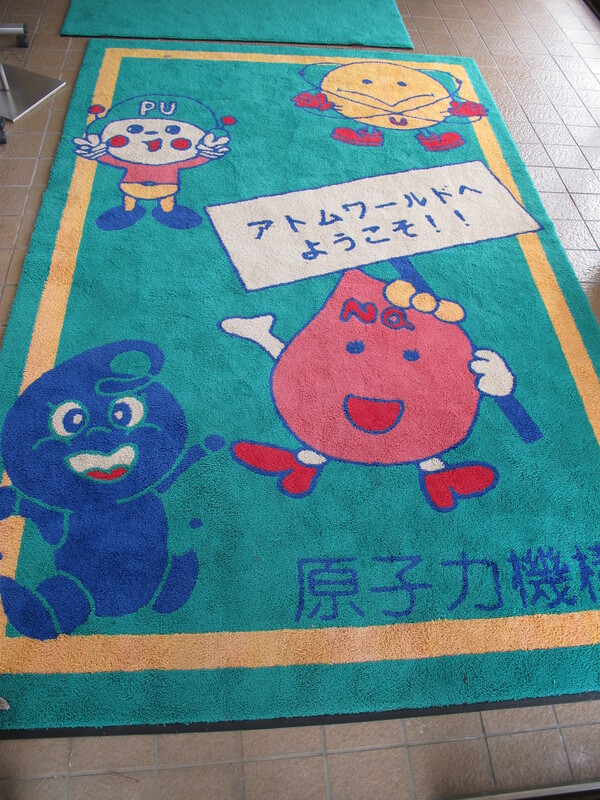 Wipe your feet, would you please, on Plutonium kun, Kid Uranium, and the lesser image characters of Natrium chan (in pink, holding the banner), named from the Japanese for the sodium that is used as a controversial coolant in fast-breeder reactors, and Glass no Sei (ガラスの精, Spirit of Glass), in blue on the bottom left, named after the glass used to harden for storage highly radioactive nuclear waste at reprocessing facilities. Admission was of course free, although this inducement to visit had no discernible effect on the number of visitors this Saturday afternoon: aside from a couple of young mothers who took advantage of the playpen in the lounge on the top floor, overlooking the JAEA Plutonium Fuel Technology Development Center, to play at greengrocers with their daughters, there was no one about but me. In the back office, a handful of clerks toiled in hushed tones to the faintest of plinky-plonk piano muzak. Shhh! Was that the sound of tens of millions of taxpayer yen being flushed down the gutter? A bureaucratic randomness stalked Atom World, too: a little lending library contained works not on matters nuclear, but a travel guide to Kenya, a collection of fishing tips, a left-brain, right-brain exposition, and a memoir of travels on Alpine railways, for instance. In the top-floor lounge hung lopsided and amateurish oils of a waterfall, a vase of camellias, a drowned forest. Atom World was also pervaded by a bureaucratic deadness of spirit in its cheap slate carpet tiles, plastic flowerbeds, and the institutional grey lino that covered its stairs. I had a desultory go at the (nuclear fuel) Cycle Game, a version of whack-a-mole in which the objective is to hit the randomly illuminated green buttons to complete the fuel cycle (no penalties for failure) but the nuclear quoits were beyond my powers of understanding. At the base of the stairs up the Cycle Hall hung four-season photos of JAEA’s Monju sodium-cooled fast-breeder reactor on the Sea of Japan coast: Monju from the beach, Monju with hydrangeas, Monju in the snow. 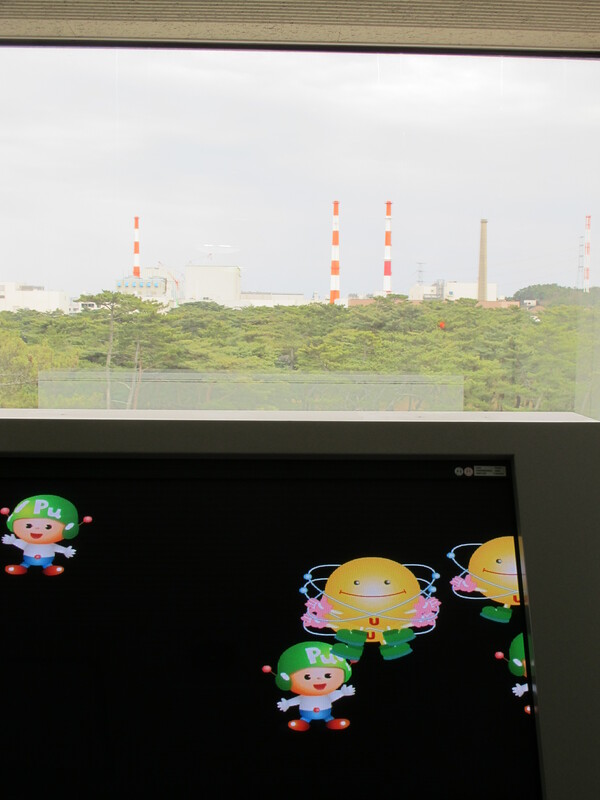 On December 8, 1995, naughty Natrium chan leaked from its secondary cooling system barely three months after Monju, more than a decade in construction, had started to generate electricity, and the subsequent cover-ups meant that it was out of action for 15 years. It reached experimental criticality again in May 2010, but yet again, barely three months later, it was hit by another accident when a three-tonne in-vessel transfer device fell into the reactor and operations were halted again, perhaps permanently this time. Three months or so of power generation in a decade and a half for a total cost of around Y2.5trn ($30bn), but hey, who’s counting? 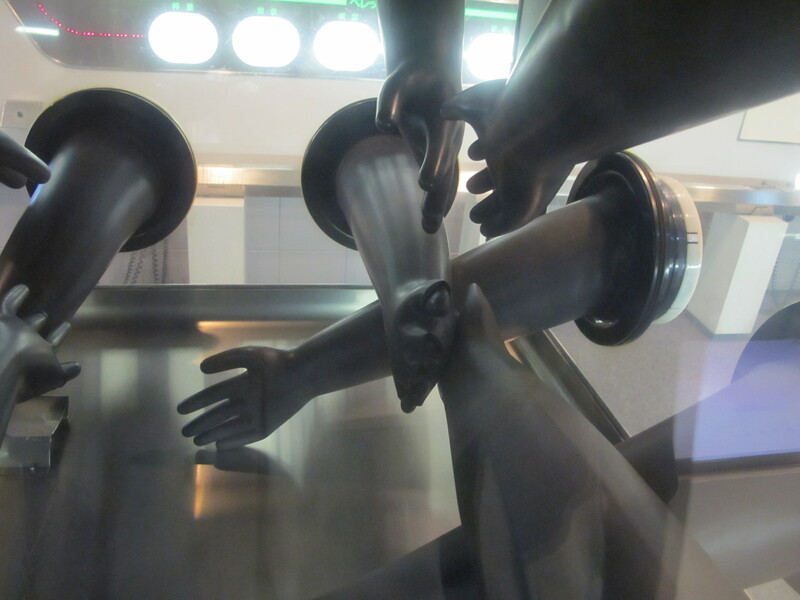 Ascending the Cycle Hall—the nuclear fuel cycle on the first floor, reprocessing spent fuel on the second, plutonium fuel and fast-breeder reactors on the third—it became alarmingly apparent that most of the exhibits with moving parts simply didn’t work. Some were adorned with ambiguous out-of-order signs that left open the question of whether this was due to the earthquake or Atom World having been starved of funds. I played at building up wooden blocks, rather than radioactive substances, with a remote nuclear manipulator and tried on some nuclear rubber gloves for size. 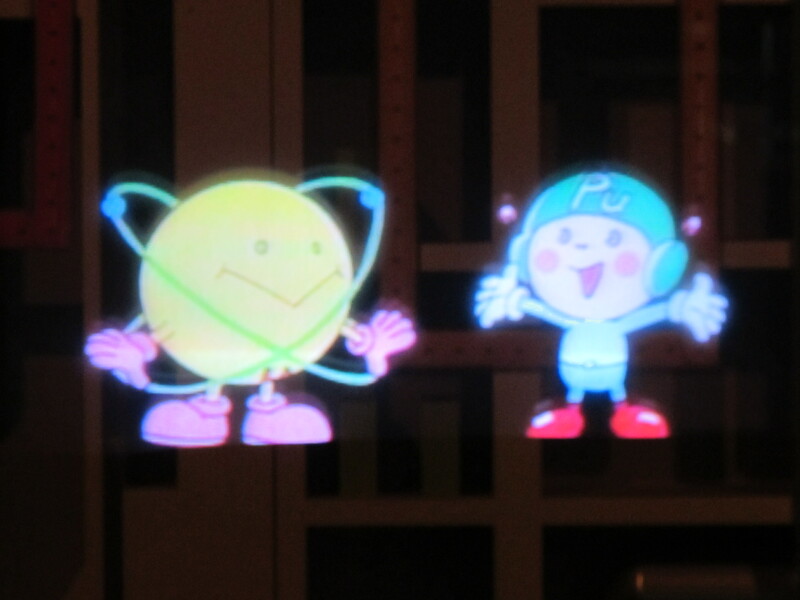 Finally I came face-to-face with an all-singing, all-dancing holographic incarnation of my idol, Plutonium kun, who was, together with his buddy Kid Uranium, compering the entertainment at the Plutonium Fuel Theater. So rapt with excitement was I as he flitted across the screen in front of a cutaway of Monju that I couldn’t concentrate on his squeaky elucidation of its marvels. 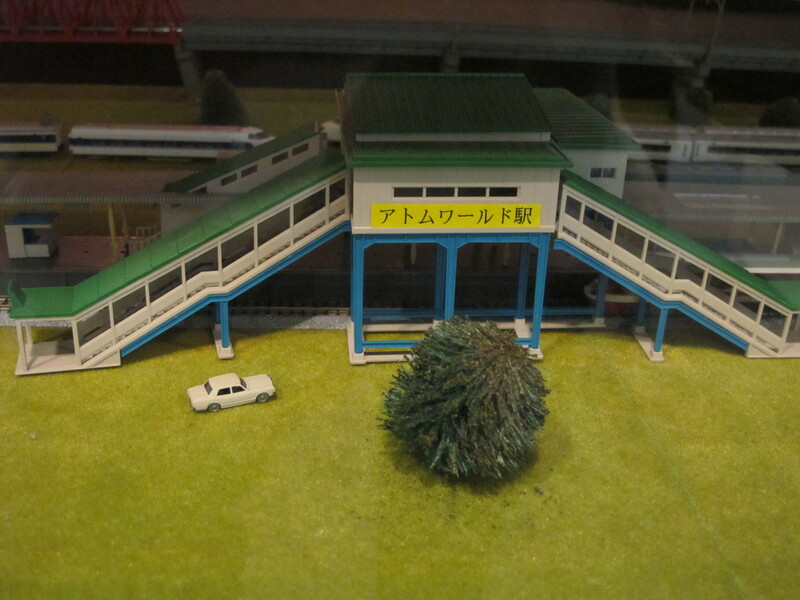 Besides, I was distracted by the model railway in the foreground of Monju, one on which no trains ran, old bullet trains had been put out to trackless pasture, and a late 70s Toyota had been randomly plunked down. The view from the top-floor lounge over the Plutonium Fuel Development Center was heaven sent. 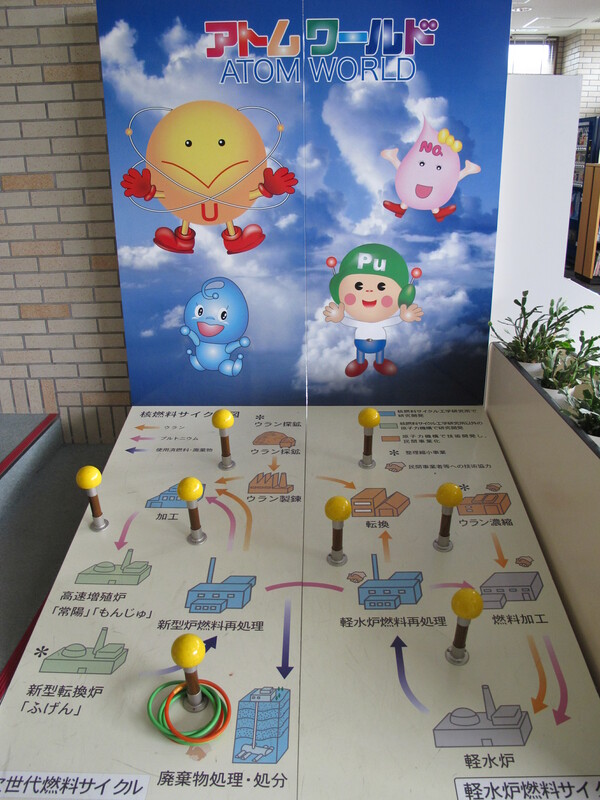 Crossing over from the Cycle Hall into the Family Hall, the Science Theater promised that “You too can go on a trip with Plutonium kun!” At last, some quality time alone with my hero. But it was not to be, for the Science Theater was out-of-order, too. Frustrated, I descended through the Energy Factory floor, where it appeared that PC booths offered free internet access but were doctored to broadcast only programs on the Science Channel website of the Japan Science and Technology Agency, and the Community Gallery floor—lovely pics of Margaret Thatcher visiting in 1982—of the Family Hall, and emerged, blinking, into watery sunlight. Mission accomplished—but there was more to do, as I’d discovered in the course of my ramblings that there was yet another nuclear leisure facility to explore, this one on the very grounds of the Tokai No. 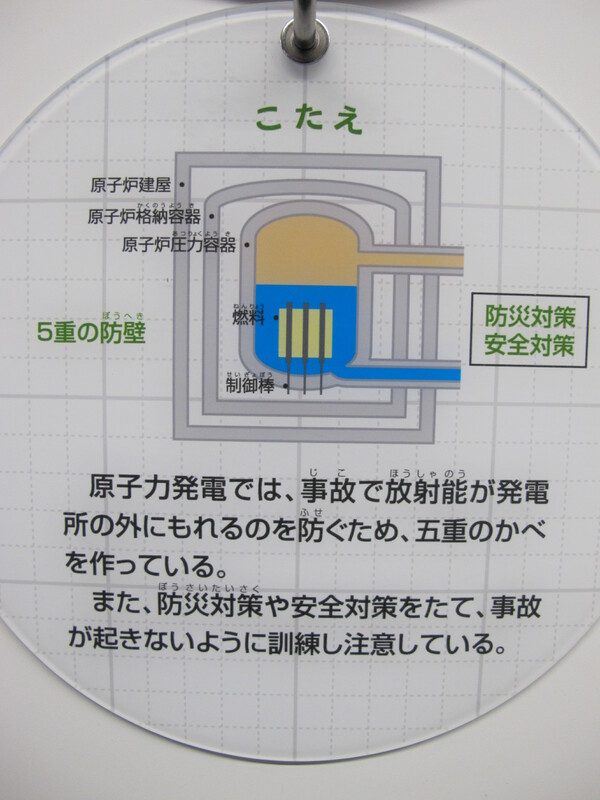 2 nuclear power plant. 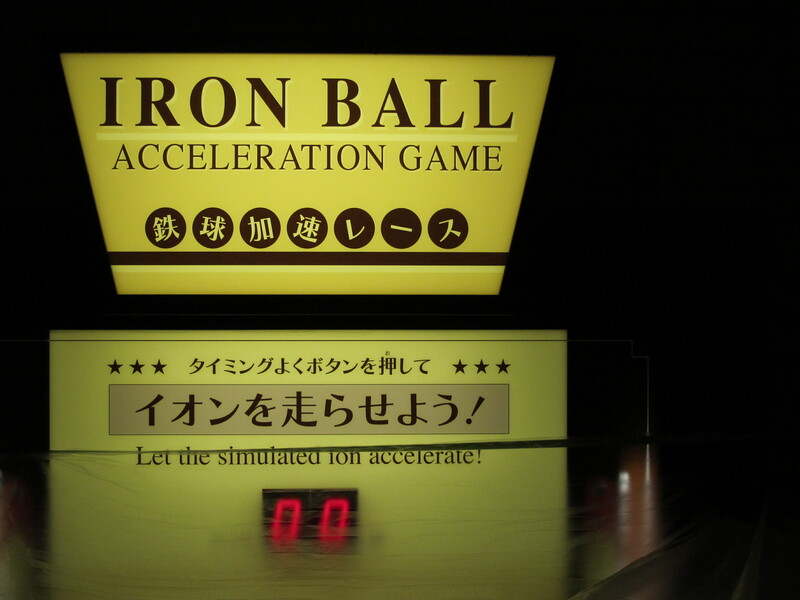 Its name had so far only been revealed in the katakana syllabary—テラパルコ—which could, I reasoned fancifully, be read either as “Terror Park” or “Terra Park”. Either, at this point, seemed equally plausible. 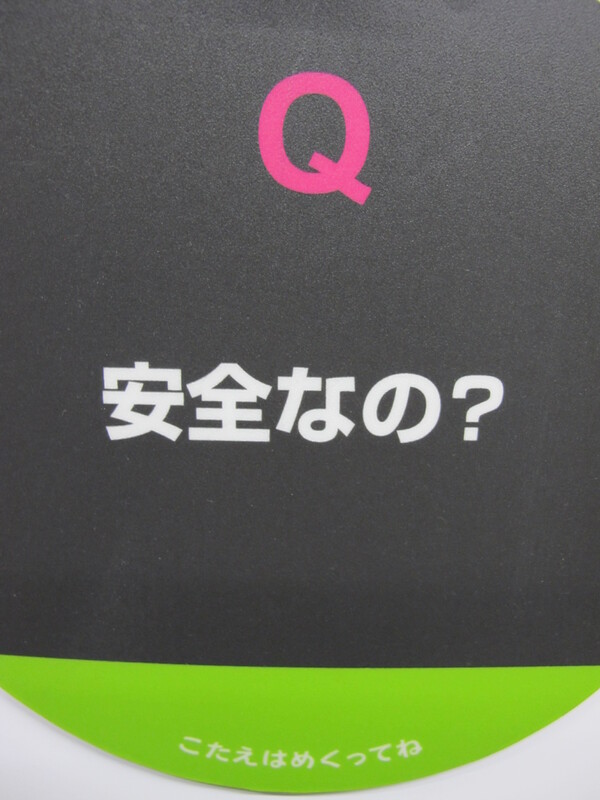 Terra-chan, the mascot of Terra Park, resolved the question. Down the five-hundred meter driveway to the guard post at the edge of the power plant complex a tight chicane of shiny red cones had hastily been erected, and I realized in retrospect this was because, just a couple of days before, a rightist sound-truck had smashed through the locked west gate of Fukushima Daini and driven around the nuclear power plant for about 10 minutes, having abortively attempted the same escapade at Fukushima Daiichi an hour earlier, before the driver, an unemployed twentysomething who implausibly gave as his home address Tokyo’s seedy and gangster-ridden entertainment district of Kabukicho, was arrested. The story has since vanished from the press and his motives remain opaque: perhaps they were to protest the shame TEPCO has brought down upon the nation. The sentry flagged me down. I did as I was bid, deprived of the chance to experience the delights of the Nuclear Power Theater and the Atom Garden—“the playground has a pond, a waterfall and a jungle gym maze for hours of fun”, says the website—and disconsolate, headed home. It would be nice to think that the events of 3/11 would spawn a nationwide debate on the future of nuclear power on the archipelago. Nice, but naïve. The mass-media that matter are wholly in the clammy hands of the nuclear-industrial complex and anyway, we don’t go in much for debate around here. Yet Japan is a shrinking society and energy efficiencies in every sphere mean we are unlikely to ever again reach the peak instantaneous power demand of the summer of just a decade ago. Meanwhile much of Tokyo, still the most populous metropolitan agglomeration on the planet and its largest concentration of absolute wealth, is about to engage—despite TEPCO’s latest assurances that it will be able to meet 95% of demand—in a fascinating experiment this summer with a 15%-25% reduction in power consumption, one that the sunniest reports suggest can be achieved at minimal economic cost and which could well demonstrate as a side-effect how profligate even this resource-starved nation has been with electric power and how superfluous TEPCO’s nuclear capacity really is. But even though the earthquake was enough to tilt the axis of the Earth, it will not be enough to set Japan on a post-growth trajectory. 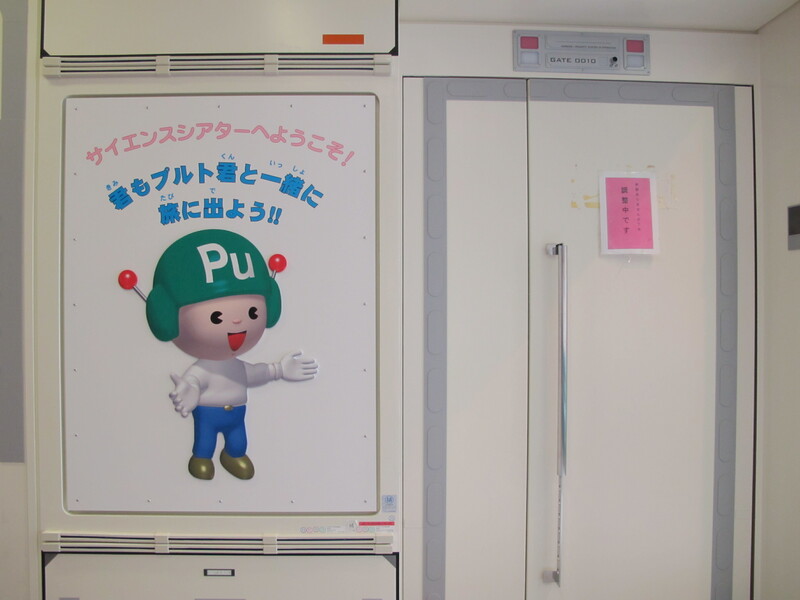 The smart money remains on the nuclear-industrial complex, and of course on its most lovable pin-up boy, Plutonium kun. Very well written and illustrated. BTW it seems that I probably have terminal prostatic cancer (not Fukushima-related) so I have insight on what will affect humanity in years to come. Gerry, I’m truly sorry to hear that. My father died of prostate cancer a few years ago, so I have some small understanding of what your loved ones and most of all you must be going through. I wish you the best of luck with the treatment. Sorry my thank you is a bit late, but I have been away for a while. I weep for myself and all humanity, even the ones who made this mess, because they knew not wahat they were doing. Indeed, a declining population does have its upsides. More wealth to go around, for one, and less need to build new stuff. One thing that struck me is that their picture of the 5 walls of containment, 3 of them are clearly pierced by the primary cooling loop! And the cooling loop’s failure caused the first containment, the fuel rod cladding, to burn up. Funny how their diagram failed to mention that when uncooled Zircalloy rapidly oxidizes in water, generating explosive hydrogen gas while exposing months if not years of fission byproducts directly to the primary coolant that is (hopefully) circulating through the reactor. Or, in Dai-ichi’s case , being pumped into the reactor from fire trucks and ending up god-knows-where. . . I did think to mention that I couldn’t really count the five walls of containment, and still can’t. My understanding was that the main feedwater line was supposed to get to the reactor vessel in a typical BWR, but hey, I’m no nuclear power station designer. Such things simply could not have been foreseen, could not have happened… And we don’t want to scare the children, who were undoubtedly bussed there in droves on school trips in the good old days, do we? it doesn’t work that way, i’m afraid. Thank you, I’m glad you enjoyed (if that’s the right word) my ramblings. 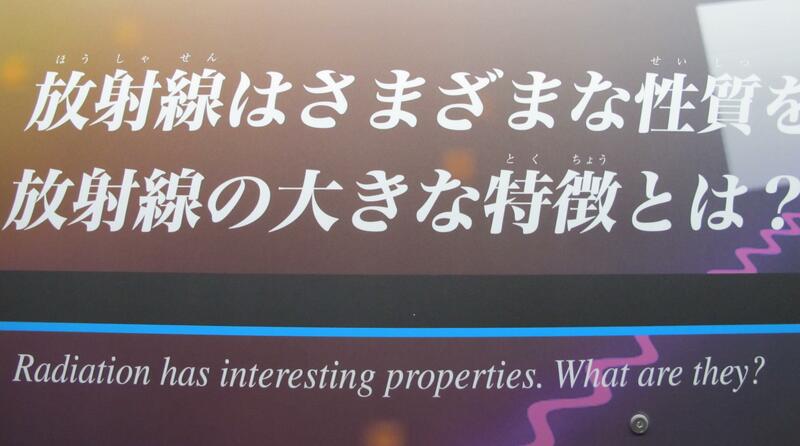 Radiation does indeed have interesting properties! 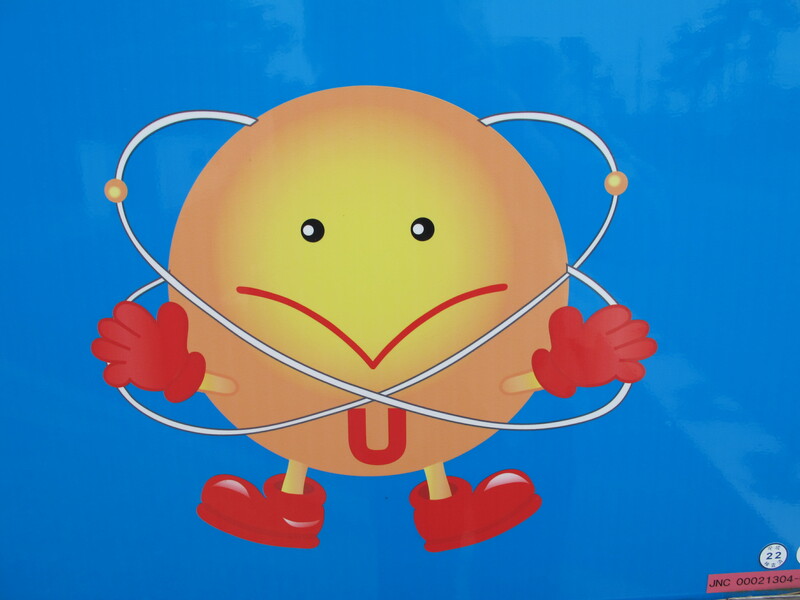 The good citizens of Kyshtym district of the USSR found that out in 1957, after one of Plutonium-kun`s early tantrums. Around 10,000 were evacuated to make way for the East Ural Nature Reserve, quite a lot of which is still an exclusion zone. Some of the magical powers included peeling skin on the face and hands. I wonder if Atom World mentioned those. 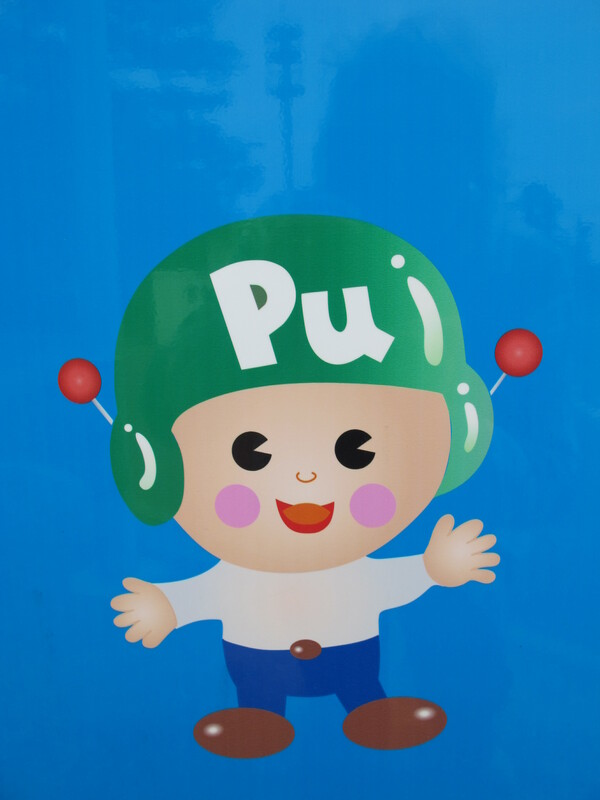 Still, I have to admit that Pu-kun is quite cute. Wonderful post, particularly the part about Monju. 2.5 trillion yen for a grand total of 3 months generating electricity. That seems staggeringly wasteful, though to be fair it seems that several fast breeder reactor projects in other parts of the world have not been entirely successful either. The German equivalent, Kalkar, mirrors much of the Monju experience, taking years to build, but never going online after some very limited operation. It was dismantled in the 1990s and now the site is an amusement park. Perhaps we could see Huis ten Bosch or a New Zealand village in Monju?! Interestingly, Toshiba is planning to set up an experimental micro reactor (Wikipedia is a bit fuzzy about whether or not it is actually a fast breeder) in very remote Galena, Alaska. Thank you for reminding me about Kyshtym. It seems the world has no collective memory anymore for anything that occurred before around 1980. Wikipedia reports that Ozyorsk, where the disaster occurred, is still a closed city. Can that be true in the brave new open world of Putin and Medvedev? TEPCO and the nuclear-industrial complex in Japan may have their faults, but they are Transparency International in comparison with the horrors of the Soviet Union in the 50s–or even in the 80s. I loved my visit to Japan. I traveled all over the country and enjoyed the ryokans, department stores, shrine cities, bullet train, dolls, Noh and Kabuki, tea ceremony, and, most of all, the people. I love Japan! It grieves me that Japan is suffering all these earthquakes and that the country is ruined in the Tohoku-Pacific region, with so much death and destruction. I believe that now is the time for the Japanese people and the government to consider acquiring a similar amount of land from Russia, perhaps on the coast of the continent, where Japanese people could resettle and rebuild a new Japan, using their island home as a resort to visit rather than as a place to live. Because of geologic activity, neither earthquakes nor tsunamis will go away. The Japanese deserve a less volatile, dangerous and uncertain place to live. How many times does disaster have to happen before the Japanese realize their chronic danger and do something to end the periodic losses of life and property? There is no paradise anywhere, but at least Japan can continue in a better locale with more peaceful and certain land conditions. Our prayers in America go out to Japan. We have permanent e-mail locations for sending money for reconstruction. That is indeed a splendidly delusional letter! Let`s move everybody to live along the Amur River! Somehow I don`t see the good people of Minato-ku moving to the Graveyard of Hope. Lots of salmon, though. A few days after this post, it seems the NYT somehow chanced upon the (obscure) expression “genshiryoku mura”…and even wrote about the threat of whistleblowers being ‘outcast’ from the village. I actually think this is a pretty respectable piece of investigative reporting of the sort that I would do if I had the time and resources to hand, and that the Gray Lady’s reporting of the disaster, in particular the nuclear angle, has been impressive. Here, for instance, we have the NYT getting into bed with the Communist Party! I have a few quibbles, from the opening paragraph on–I very much doubt that the 2000 Fukushima Daiichi scandal was the “most serious cover-up in the history of Japanese nuclear power” (Monju in 1995 looks worse to me), but I’m not an expert. Glad you enjoyed the piece. But Tepco surely will again. Fukuchan will keep you warm..
A very belated thanks; think I’ll take Willie the Shake over little Bobby D! I don’t use Twitter, but I saw this. Snap! Yes I discovered that poor old Denryokukan was never to reopen the same day you commented. 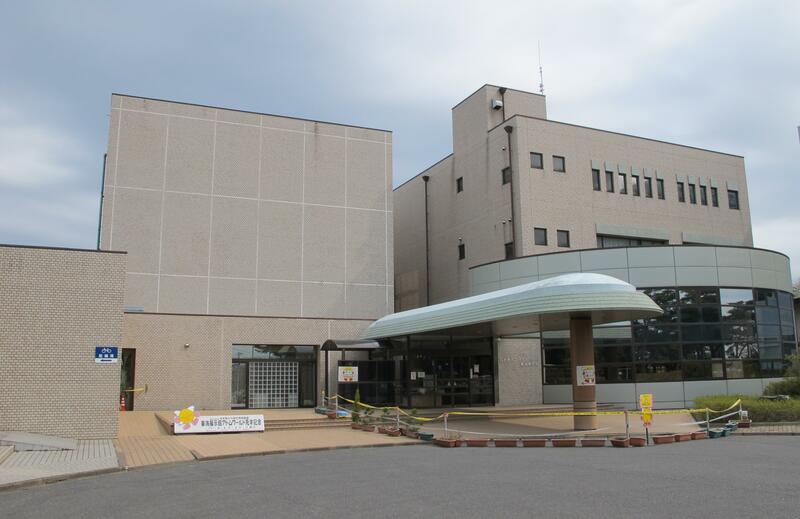 Would love to sneak inside just once before its new owners strip out TEPCO’s ill-fated refurbishment.